« Don’t Renovate for the Next Owners – Renovate So YOU Can Enjoy! There’s one thing we can all agree on: wanting to hold onto more of our hard-earned dollars. So, when working with homeowners who comment on wanting to be sure their home is functioning most efficiently, we often recommend they go with insulated vinyl siding. Vinyl siding is optimal for its higher R-value, lower thermal bridging, and increased airtightness. All of these factors translate to lower energy bills in both the summer and winter. Insulated siding acts as a heavy-duty coat for your home in the colder months, and a tightly sealed cooler for your air conditioned interior during the summer. Insulated siding improves energy efficiency by reducing thermal bridging. Thermal bridging is what happens when heat passes through wall studs, since they are made up of wood and metal – both poor insulators. Adding a layer of insulated siding acts as a blanket for the entire home, and eliminates this energy waste. 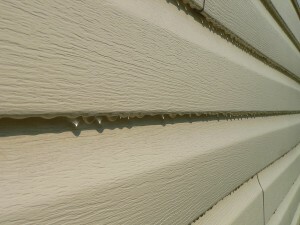 Compared to hollow back siding, insulated vinyl siding is thicker and more rigid, and the insulation panel is connected to the siding itself. Vinyl siding is also recognized as a sustainable siding option, if green building is high on your list! If your siding is old and worn, or if you’re just looking to see savings in your energy bill this summer – give Gerald Jones Company a call and talk with us about options for improving your home’s efficiency with insulated siding. Call today at 919-286-1700 for your free, no-obligation estimate! This entry was written by Gerald Jones Company, posted on May 10, 2016 at 9:22 am, filed under Uncategorized and tagged home improvement, home remodeling contractor, home upgrade, insulated siding, new siding, vinyl siding. Bookmark the permalink. Follow any comments here with the RSS feed for this post. Both comments and trackbacks are currently closed.